Regalia, B., Janowicz, K., McKenzie, G. (Accepted) Computing and Querying Strict, Approximate, and Metrically-Refined Topological Relations in Linked Geographic Data. Transactions in GIS. Wiley Press. McKenzie, G. and Raubal, M. Ground-truthing spatial activities through online social networking data. 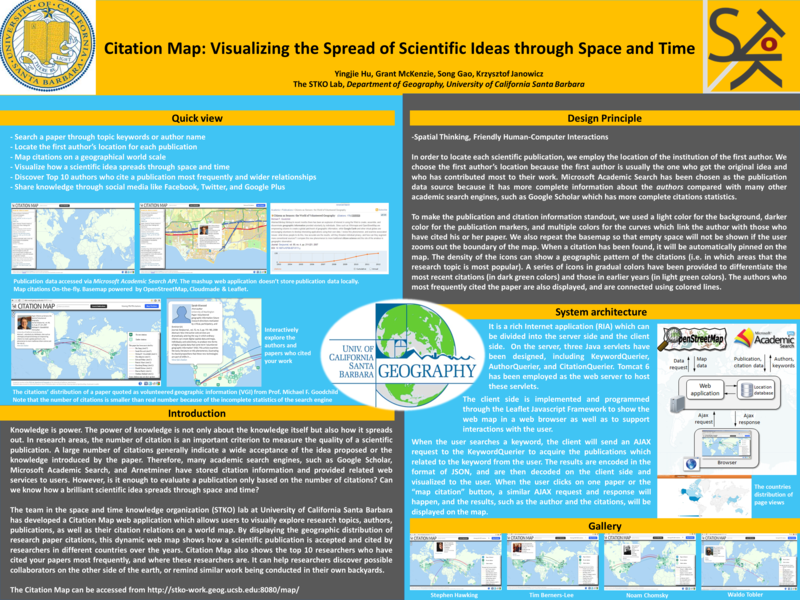 Extended Abstracts of the Seventh International Conference on Geographic Information Science (GIScience 2012) Columbus, OH. Hu, Y., Li, W., Janowicz, K., Deutsch, K., McKenzie, G., Goulias, K. Using spatial-temporal signatures to infer human activities from personal trajectories on location-enabled mobile devices. Extended Abstracts of the Seventh International Conference on Geographic Information Science (GIScience 2012), Columbus, OH. Adams, B. and McKenzie, G. Frankenplace: An Application for Similarity-Based Place Search. Application Demo at the 6th International AAAI Conference on Weblogs and Social Media (ICWSM-12), Dublin, Ireland, AAAI Press. Liu, Z., McKenzie, G. Identifying Spatiotemporal Activity Patterns in Beijing Based on Geosocial Microblogs. Center for Geospatial Information Science Inauguration, College Park, MD. Lee, M., Aghi, R., McKenzie, G. Toward Identifying Neighborhoods: Activity-based Clustering Analyses. HCIL Symposium Poster Session, College Park, MD. Barrett, T., McKenzie, G., Hegarty, M., Thompson, W. B., Goodchild, M. F. (2013) Understanding the "Blue Dot" in Smartphone Displays. spatial@ucsb.local13 Poster Session, Santa Barbara CA. Deutsch, K., McKenzie, G., Hu, Y., Janowicz, J., Li, W., and Goulias, K., Examining the Use of Smartphones and Data Quality in Data Collection for Travel Behavior Research. Proceedings of the International Association of Travel Behavior Research, Toronto, ON. Workshop Chair. Spatial Data on the Web (SDW) 2016 at the Ninth International Conference on Geographic Information Science (GIScience '16') - Montreal, Canada. Workshop Chair. GeoVoCamp DC - College Park, Maryland. Workshop Chair. GeoPrivacy: 2nd Workshop on Privacy in Geographic Information Collection and Analysis at The 23nd International Conference on Advances in Geographic Information Systems (ACM SIGSPATIAL 2015) - Seattle, Washington. Workshop Chair. GeoPrivacy: 1st Workshop on Privacy in Geographic Information Collection and Analysis at The 22nd International Conference on Advances in Geographic Information Systems (ACM SIGSPATIAL 2014) - Dallas, Texas. Workshop Chair. Workshop on Geographic Information Observatories at The 8th International Conference on Geographic Information Science (GIScience 2014) - Vienna, Austria.